Turkey: Skate/classic. The Turkey is a 1.2km beginner trail. 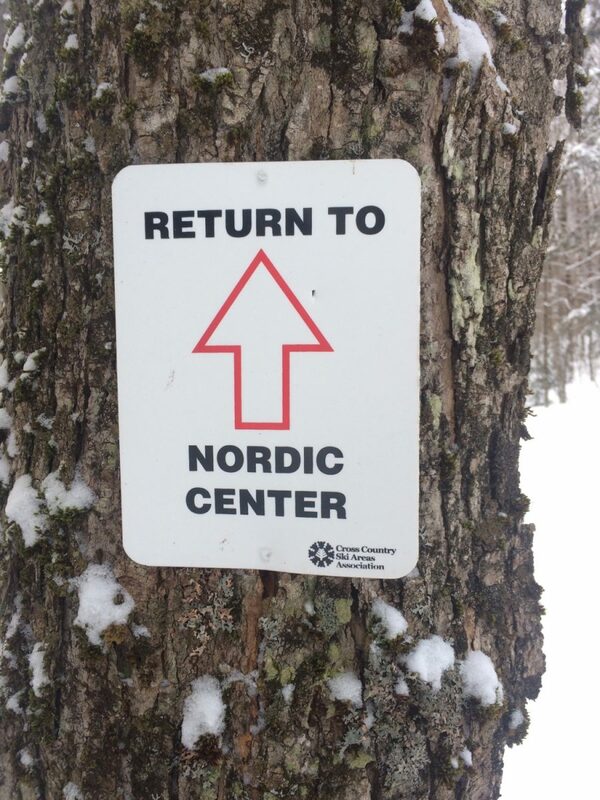 This trail is enjoyed by skiers of all abilities, from true beginners to Olympic racers (seriously!). For 2018/2019, Turkey will be groomed for skate skiing, but it’s still classic-able. Ian will put a classic track close to the edge when conditions allow. We will widen the trail for 2019/2020 and it will be a true skate/classic combo trail. Woodcock: Classic. A 2.0km trail crossing North Road, the Woodcock meanders through the forest, along Styles Brook, past an old beaver pond, and past an old sawmill’s sawdust pile. 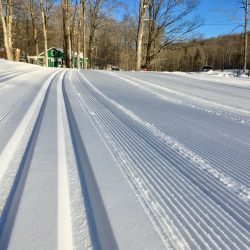 A nice easier trail, groomed with double classic tracks (one track will be set when conditions are very fast to allow more snowplow and snowshoe space, no tracks on downhills). Snow Goose: A favorite of many, the Snow Goose (2.5km) begins off of Woodcock and offers great gently rolling terrain with the option of adding a good climb and fast descent with MacQuaig’s Field. A good trail for a beginner looking to get farther out into the forest. Also a great double-pole loop. Grouse: The Grouse is a short (1km) trail with a long steep climb followed by a long gradual downhill. A good trail to ‘test the waters’ of Blue and Black trails. Chickadee: ‘The all-time best trail ever’ winds 6.5km through the forest with a great mix of climbing and descending. Starts with a few steep climbs, then flattens out (mostly) for the remainder. Big downhill finish. Lots of gradual uphills with perfect grade for striding. 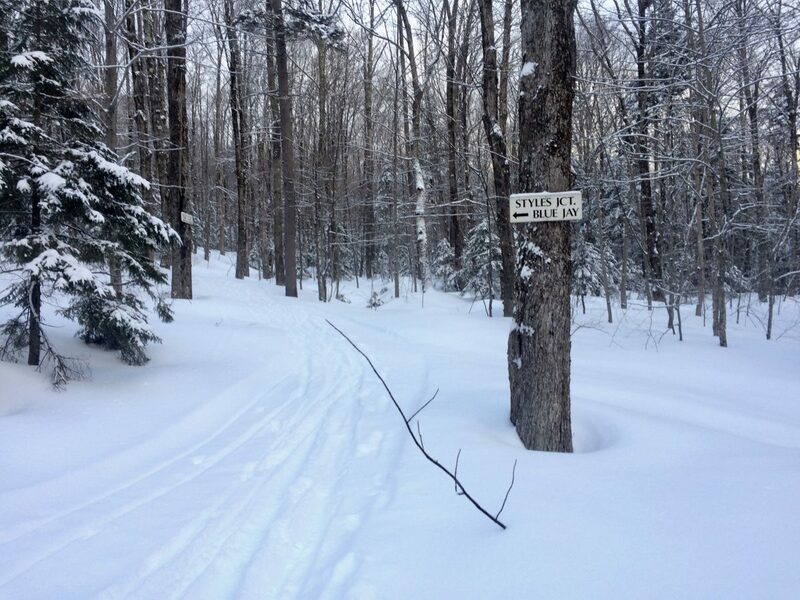 Add Loon and Upper Blue Jay for an amazing 11km ski. There are many wet/swampy areas so we need cold weather and a lot of snow to groom it. Loon: An extension of the Chickadee adding 2km of dips and dives. Good views of Styles Peak and Peru Peak. Great views of abandoned and active beaver ponds. Goshawk: Goshawk was mostly taken over by Peregrine, but you can use the old Goshawk climb to access the second half of Peregrine. Always the shortest route back. Peregrine: The newest trail, Peregrine is a super hilly, super fun skate/classic combo trail. It winds its way up the hill behind the barn, following roughly where the old Lower Bluejay was. It comes down where the upper section of Goshawk used to be. 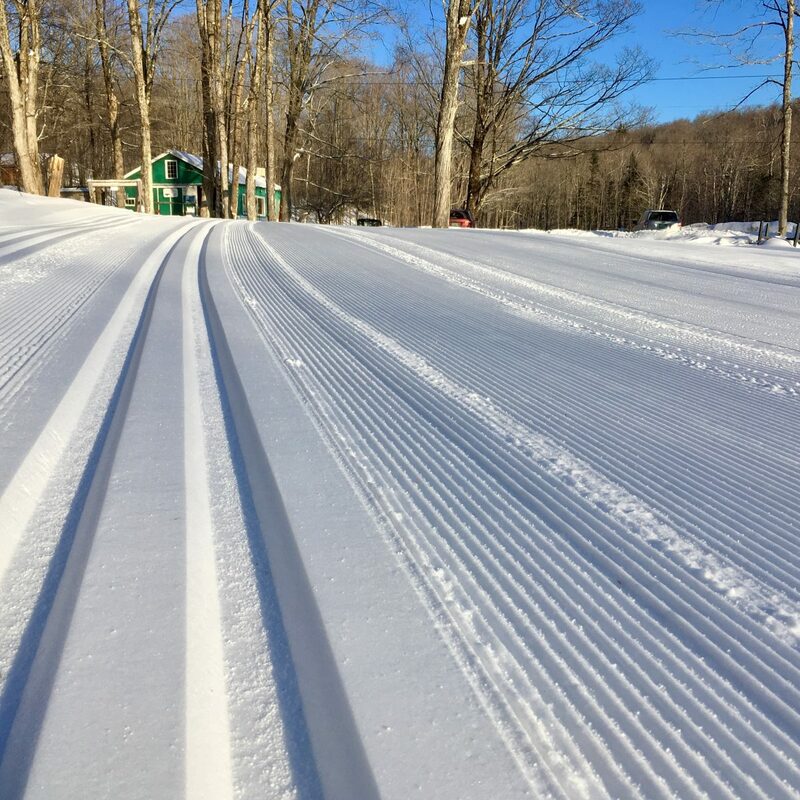 It was mainly built for racers to train on, but adventurous skiers of all abilities love it! Upper Bluejay: A 2km loop beginning at Styles Junction (top of Middle Bluejay and right before Chickadee’s final descent). A short climb followed by a great mix of gradual up and down will bring you to to highest point on the Wild Wings trails, at about 2100′. A mellow but fun downhill back to Chickadee, where it climbs briefly before the final 1km downhill back to the barn.